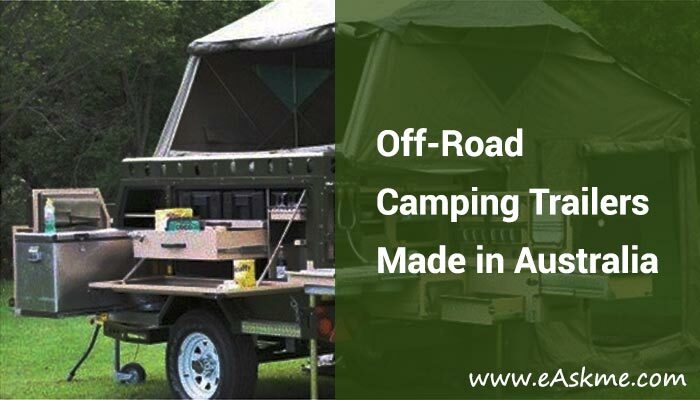 Sometimes you just want to refresh your selves with an off-road adventure with your whole family, so we are letting you know about a huge range of off-road camper trailers you can easily buy. By having it you will be at complete ease, it will facilitate you with roomy, soft floor up till the eventual in a style which includes 6 Bert for family campers. You can definitely clear out with complete ease and comfort wherever you wish to go to. As you all know that Australia is just filled with the best locations of camping in the whole world, so now you can easily go to those million dollar location and make yourself happier and the plus point is that you can even beat complete pleasure by having camper trailers which are built for much serious off-road travel, you can conveniently travel in it with your total style and being In luxury. Purchase a new camper trailer and refresh your mood by making some new adventures by those camper trailers in Sydney. Below we have mentioned some best camper trailers you can have. This trailer is the unit of light off-road; it is packed with the characters of its ultimate counterparts. Its inclusion is having close weave tent, completely powdered coated chassis, electric brakes of 10 inches, drawbar of 1650mm which also have coupling. Its chassis and drawbar are completely welded. The structure of its trailer is checker plate steel, and it is also completely welded. The trailer is finished with powder coating. It is having an LED tail and Led Number plate lights. Its storage is massive checker plate toolbox. Its water tank can store up to 85L, and it's a poly water tank. The features of tent include 15oz close weave canvas walls accompanied with 18oz close weave roof; its height is 2.3m at highest. The bed size base is 2.25m × 1.7m. It will provide you complete comfort and ease on travel. The TBOX V7 camper trailer is characterized by its ultimate counterparts. It’s being tested in Australia’s most rasping conditions to get to know that it is able to resist every unit of Australia you wanted to traverse. Its inclusion is featured in full reinforced chassis; it is completely welded with the finish of powder coating. It is lined with carpet. It is having 4WD 10 inches electric brakes, and hand brakes are also added in it. It is also having Annexe walls, Annexe roof, Annexe floor, and tailgate cover. Its trailer is specified in drawbar of 1900mm which also includes coupling. Its structure is press folded and entirely welded. It has lights which are the submersible LED tail and LED number plate. The features of tent include 15oz close weave canvas wall accompanied with 180z close weave roof. Its highest point is 2.3m. Its floor is completely sealed and sewn. The bed base size is 2.25m × 1.7m. It is the latest expedition series of camper trailers, which is having all the expected features with much fewer cost. The features of inclusion are slide out kitchen including S/S sink; gas certifies 3 burner stove, 80 liters of the water tank. Its battery is 1 × 100AH AGM battery. Its trailer is finished with black finishing. The length of the trailer is 5200. The structure of trailer is front and top is of thick checker pate panel, and cross beams are also included. Its tent is huge in size, and its color is of a sand/khaki color. Its highest height is 3.2 m. It will serve you with complete comfort. Choose the Best Vinyl Sticker Machine?